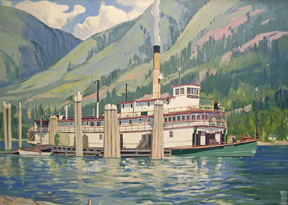 A collection of thirty-two oil paintings of the historical Kootenay sternwheelers, “Echoes of the Paddlewheel,” by Alex Garner (1897-1995) will be repatriated from the Glenbow Museum (Calgary) where they were donated approximately fifty years ago. Garner had a long and distinguished career as a painter primarily of landscapes, portraits and historical West Kootenay subjects. The exhibition will feature also feature paintings from local private collectors and paddlewheeler historical models by North Shore resident and model-maker, Bert Learmonth. Exhibition sponsored by Columbia Basin Trust and Columbia Kootenay Cultural Alliance. A project that began September 1, 2006 and carried out for minimum of one year, lasting until at least August 2007. During this period, one sheet of drawings is produced at work during each workday. One square on the grid is filled with a drawing every fifteen minutes. No sheets are produced on weekends, since this is not a scheduled workday. The grid is laid out so that there are four squares per line, with each line representing one hour. No drawings are produced on days when no work is done. Therefore, lunch breaks or holidays are left blank. A blank sheet represents a statutory holiday or other time spent away from work. In this way, the sheets visually represent time worked. At the end of one year, 260 individual sheets will have been prepared – arranged five sheets in a group, each set of sheets will represent a workweek. Fifty-two sets of drawings will represent one year, to be exhibited chronologically. Explore the ordinary… Seeds are all around us: we eat them; we plant them; they parachute from dandelions; they catch in the dog’s coat or on your socks; they drop from the trees; and sometimes they even hang around your neck. This exhibition features ornamental seeds “disguised” as beads in jewellery, trinkets and ornaments. Seeds, like people, have many interesting facets to their complex biology. Travel, chemistry, medicine and industry are part of the stories of the ornamental seeds in this exhibition. Beware – some seeds are dangerous! This exhibition is colourful and elegantly laid out. 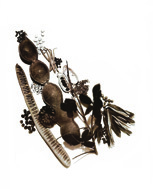 Divided into six topics: Beans: Diversity in a Plant Family, Seed Signals, Seeds from Food Plants, Seeds with Commercial Use, Poisonous Seeds Among Us and On the High Seas, information is presented in English and French. Touring exhibition from the Osoyoos Museum. The drawings featured in this exhibition were created by children of the Osoyoos Indian Band who attended the Inkameep Day School, near Oliver, British Columbia, on the Nk’Mip Reserve. Between 1932 and 1942 these students and their teacher, Anthony Walsh worked together to create drawings, paintings, stories and plays that honoured traditional Okanagan language and culture. 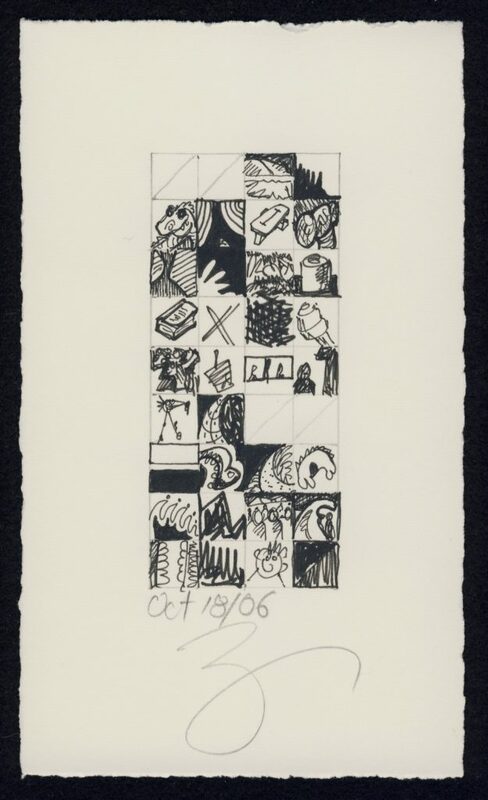 The arts became a way for the students, aged six to sixteen, to depict their everyday realities and their evolving sense of identity, growing up in mid-twentieth-century British Columbia. Their world was complex, layering Okanagan traditions and stories, old and new ways of life, an evolving agricultural economy, and North American popular culture. Between 1863 and 1984, thousands of First Nations children across Canada were separated from their families and communities and sent away to government-run residential schools. These schools focused on cultural assimilation, deliberately and completely suppressing Native language and culture. There is little documentation of what aboriginal children’s lives were like in Canada between the first and second World Wars that is not associated with life in the residential school setting. The drawings from Inkameep Day School tell a very different story from those of many First Nations schoolchildren in the mid-twentieth century. This exhibition, comprised of 33-56 pieces, gives rare insight into how these children lived their lives and saw their world, and into the ongoing national dialogue around the history of evolving ideas of Canadian identity and citizenship. 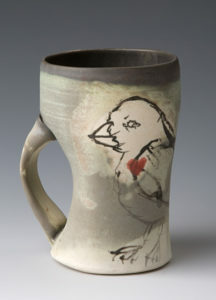 A group exhibition of contemporary craft and design featuring the 2007 graduating class from this regional institution of art and craft education, recently amalgamated with Selkirk College. In partnership with Kootenay School of the Arts at Selkirk College. Project for Calendar Studies is comprised of twenty multi-media/process works that grew from an investigation into the relationship between form, content, and process. 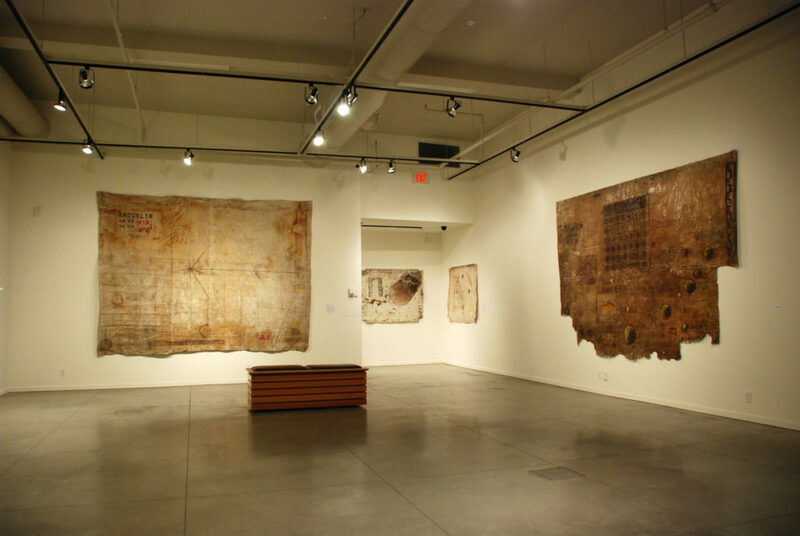 The work was created out of doors, using sustained exposure to a variety of natural and artificial elements to facilitate the printing of the primary images. The work is divided into two groups – canal work and roof work, with both groups sharing aspects of time-reckoning: notations, words, symbols, and relationships through which we account for the passing of time. The canal work was developed through a process of submerging the canvas in a tidal canal in Brooklyn and recording the passage of time and the rise and fall of the water levels. The roof work was developed through the application of a raw iron-filings left exposed to weather conditions. The canvases were then imprinted with additional imagery and surface treatment either on location or in the studio. In partnership with Oxygen Art Centre; 2008 Artist in Residence. A heritage/historical exhibition surveying the history of curling in Nelson, from the first Midsummer Bonspiel in 1945 to the conclusion of this sports tradition with the last Bonspiel in July 2008. 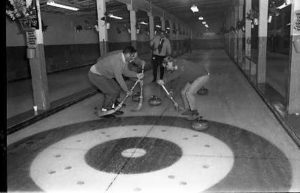 The exhibition will feature historical artefacts, archival images, film footage and related ephemera from the Touchstones Permanent Collection and Archives, the Nelson Curling Club and local and regional private collectors. A retrospective of the work of local resident and international colour theorist and plein air painter John Cooper. The exhibition will include work from the 1960’s to the present, comprised mainly of paintings and supplemented with constructed and painted sculptures and trophies and a multi-media component featuring four performance-based films John has made over his career. The exhibition will be accompanied by the work of four to six plein air painters whose work has been influenced or inspired by John’s work and passion for colour theory or plein air painting. The artists and works will be selected by the curator in consultation with the artist. 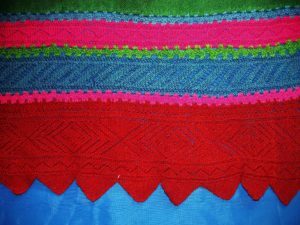 Doukhobor woman’s apron, hand-woven and dyed with colourful bands of knitted wool trim across the bottom and a hand-woven black waistband and ties. This 850-square-foot, in-house produced exhibition surveying the textile practices applied by the Doukhobor culture in the early years of their settlement in the West Kootenay region will feature the Doukhobor textiles (clothing, linens, and rugs) and implements used in the production of textiles, drawn from the Touchstones Permanent Collection, and supported with interpretive text, documents and photos from the Touchstones Archives. The exhibition will be supplemented with items and ephemera borrowed from local private collectors and the Doukhobor Village Museum, located in neighbouring Castlegar, BC. The result will be a survey of the handicraft and textile practices applied by the Doukhobor culture in the early years of their settlement in the region. During her research tour of the area, Dorothy K. Burnham, former Curator of Textiles at the Royal Ontario Museum and author of the premier book on the subject, Unlike the Lilies: Doukhobor Textile Traditions in Canada, found the Touchstones Doukhobor Textile Collection comprised an extensive study collection of Doukhobor textiles (clothing, linens and rugs) that was not found elsewhere in the region. The items in the collection, dating between 1890 and 1940, consist of garments brought from Russia and made in Canada, including articles for everyday use, and items reserved for ceremonial dress and a variety of accompanying accessories. A selection of domestic textiles includes woven and hand-tufted rugs for use on floor or bed, kitchen and table linens, and a range of hand-crafted trim for application to garments and domestic textiles. 2008 marks the 100th anniversary of the Doukhobor settlement in the area. The Doukhobor Village Museum in Castlegar will be offer programming to mark this important occasion, during their operational months of May 1st to September 30th. The exhibition at Touchstones is scheduled for September/October/November 2008, after the Doukhobor Museum has closed and concluded their programming for the year. 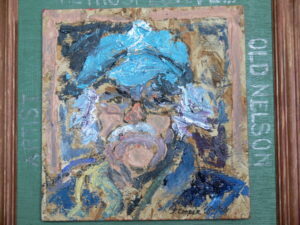 A curated exhibition featuring the paintings of local resident and international painter Peter Velisek. The exhibition will include work from the two areas of subject matter that reflect Peter’s daily life experience: rural images from his life as a sustenance farmer in the Slocan Valley and urban images from his annual trips to his home town in the Czech Republic. 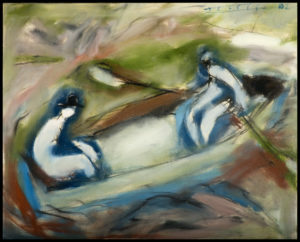 A possible pairing with a second Expressionist painter from the region is being considered. As a white African raised in pre-revolution South Africa, a segregated and violent society, Johnson sought out the traditional sacred ceremonies of the indigenous peoples, participating in, witnessing and being initiated into the spiritual practices. The work of Lines in Blood and Milk integrates facets of the artist’s spiritual exploration through intention, dream, ceremony and paint, presented in forty-nine oil, acrylic and mixed-media paintings arranged in an installation-like environment. Employing a personal symbolic language, the artist claims the process of creation is as much a part of the journey as the spiritual experiences. 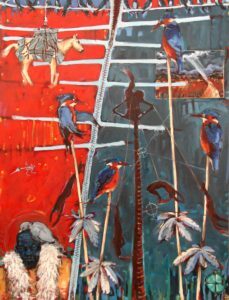 Aware of issues of cultural appropriation, the artist presents the work not as a didactic portrayal of traditional ceremonies, but a truthful exploration of ceremonial ways, creation, and the means for its continuation, through a personal experience and expressed in the form of paint and image. Touring exhibition; an exhibition of glass and bronze sculpture drawing influence from historic tool design by Lou Lynn, a resident of the area and a senior artist in the community, exhibiting at the national and international level, who has contributed to the development of fine craft and professional practices through teaching at the Kootenay School of the Arts and the development of the Beyond Borders Craft Marketing Conference. 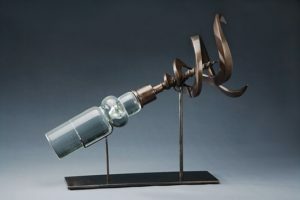 Select pieces from Implements & Objects, currently touring, with earlier work that was a catalyst for that body of work (comprised of cast glass, cast aluminium & glass), with the addition of a new wall-mounted piece currently in development, comprised of tool-related details, for which the artist received a Canada Council project grant.